Deaf Aotearoa plan to invest heavily in iSign service improvements over the next 12 months as communicated recently on Deaf Aotearoa’s website and at recent events. This Update repeats some information in the 15th July iSign update [insert hyperlink to website] and provides some further information. Deaf Aotearoa will continue to share information and will provide ongoing opportunities to engage with this work going forward. iSign provides interpreting services in all parts of the country. iSign has always been a business owned and operated by Deaf Aotearoa Holdings Limited and this will remain the same. There will continue to be a separation of duties with regards to service user engagement and management of information, including maintaining confidentiality of service user information. iSign service users will continue to engage directly with iSign (not through Deaf Aotearoa) and interpreter bookings will continue to be managed by iSign booking staff separately and confidentially. iSign will also maintain its separate brand identity. iSign will operate under the same conditions as all other services within Deaf Aotearoa. iSign’s back office business support functions will be shared with Deaf Aotearoa, eg: finance, communications, IT, HR and quality controls. This has always been the case and is not a change. Recent reviews of iSign services have identified things iSign is doing well and things that need to be done better. Thus, Deaf Aotearoa will be investing heavily in iSign’s development over the next 12 months. Deaf Aotearoa will share information and ideas and seek further feedback on improvements going forward. Deaf Aotearoa have appointed an iSign Interpreter Team Leader, Alan Wendt to lead the training, support and development of both in-house salaried interpreters and freelance interpreters. Deaf Aoteroa Development and Outcomes Team Leader, Kellye Bensley is responsible for iSign booking officers and for improving the Booking systems. This work is focused on improving iSign systems for supporting and developing interpreters and ensuring the Booking systems are more efficient and ensure a high quality, confidential service. This work to improve iSign systems will be overseen by Victoria Manning, Communications and Strategy Manager. Please note, this work is focused on improving iSign service systems and these staff people will not access the Booking Officers confidential information about job bookings. The community can expect iSign service booking requests to continue and Deaf Aotearoa is working hard to ensure there is no disruption to iSign booking services while improvements to the system are made. The iSign booking system will be made more efficient, this includes making better use of modern information technologies and modern call centre technologies to make sure bookings are managed efficiently. iSign has retained four full-time Booking Officers and will look at increasing this if needed. Booking officers working hours have been re-arranged into shifts so that bookings can be responded to between the hours of 8am and 6pm (previously, the booking service closed at 4.30pm). This means the service is more accessible than ever before. iSign is shifting to a new centralised booking system and has a new email address for bookings, bookings@iSign.co.nz. Existing and old emails addresses will continue to work in the meantime. Currently, booking staff do not have an even workload and this has created unequal workloads and has made it difficult to provide a consistent quality service. A centralized booking system will ensure staff are better supported with an even spread of work and responsibilities. Please note, training and systems are being provided to ensure booking staff have access to local information in all areas. All booking staff can handle your local requests and preferences and have access to the information they need. Booking staff work as a team to provide iSign bookings all around the country from 8am – 6pm Monday to Friday. Booking staff services are provided via IT systems (emails, phone, texts, etc) and they are connected by an internal IT system only they can access. Booking staff are physically located in Deaf Aoteaora’s Avondale, Waikato and Christchurch offices. The Booking staff are in separate, private rooms and their information is kept confidential from other Deaf Aotearoa staff. We will no longer need the separate premises in Royal Oak and that office will be closed soon. Deaf Aoteroa has organized TEC workshops for the community. This is an opportunity to come to hear more about how we’re improving Deaf Aotearoa services to Deaf people. Please come to these workshops to see the information directly and to ask any questions you have. Deaf Aotearoa staff are happy to clarify and answer questions. You will need to book a place at the workshops as we expect them to be busy and we want to make sure that the venues and resources are suitable for the people who want to attend. Deaf Aotearoa is proud to support Māori Language week! 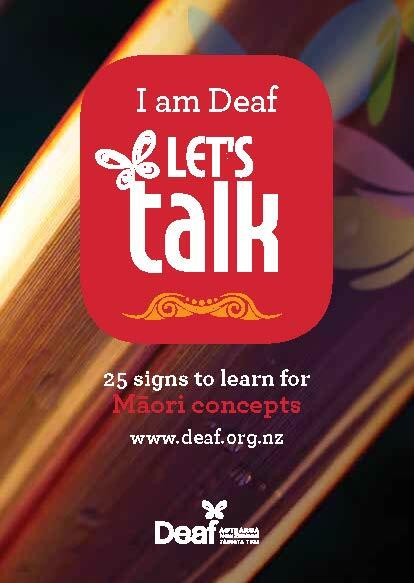 You can click below to view our Māori concepts booklet which includes 25 Māori signs. Or check out the video which will teach you nine Māori signs! 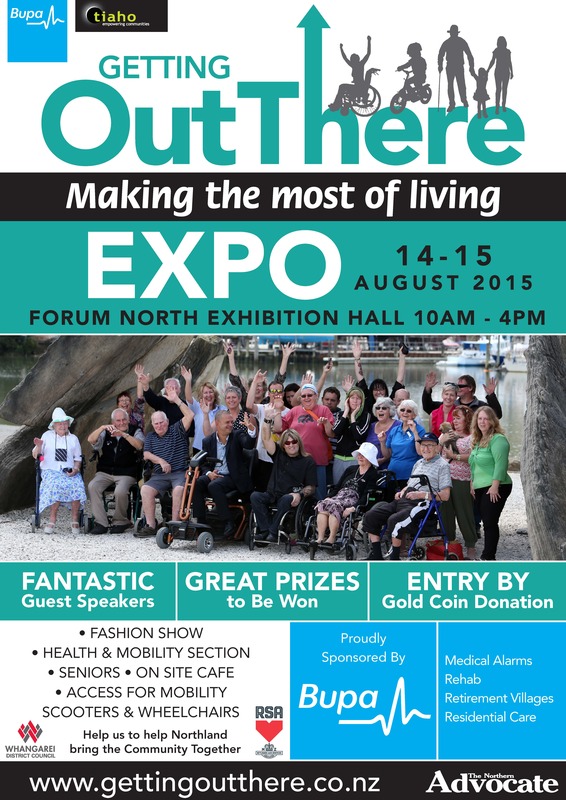 The Getting Out There – Making the Most of Living Expo for disabled people and seniors will be held Deaf friendly. There will be two NZSL Interpreters present at the Expo over the two days. The presence of two NZSL Interpreters is made possible by the generous support of iSign. Tiaho Trust is hosting the Expo which will be held at Forum North, Whangarei on Friday 14 August and Saturday 15th August (10am-4pm both days). This Expo, supported by Bupa and the Northern Advocate, is for all members of the community who have an interest in health and mobility, including seniors and those who want to make the most of living! A key note speaker at the Expo is the one and only Mojo Mathers! New Zealand’s first Deaf, Member of Parliament. Other guest speakers are: Mayor Sheryl Mai, Mojo Mathers (MP), Winston Peters (MP), Dr Sonya Porter-Auld (a Registered Psychologist speaking on tools to fight depression and anxiety), Dr Huhana Hickey (MBE recipient, veteran disability activist) and Grianne Moss (Managing Director of Bupa). In our demonstration room there will be NZSL Taster Classes, cooking classes, Tai Chi and more! The Getting Out There EXPO is designed to demonstrate that despite age, health or disability, everyone can make the most of life! A fun event packed with plenty of entertainment, giveaways and opportunities to learn more about the services, support and groups geared up to enable more people to live well. Fully accessible for mobility scooters and wheelchairs. Do you have an old chair or stool that needs re-covering? Do you have sewing skills? Then bring your favourite piece of furniture back to life! An information evening will be held before the workshop where you can talk about your project with the Deaf tutor and calculate fabric quantities. Learn the basics of upholstery in this weekend workshop with an experienced Deaf tutor. Only small projects will be accepted – no large furniture allowed due to limited time. Use of staple gun are free. Material costs are extra. Do you have a learners or restricted licence? Want to reduce the time to get your full licence quicker? 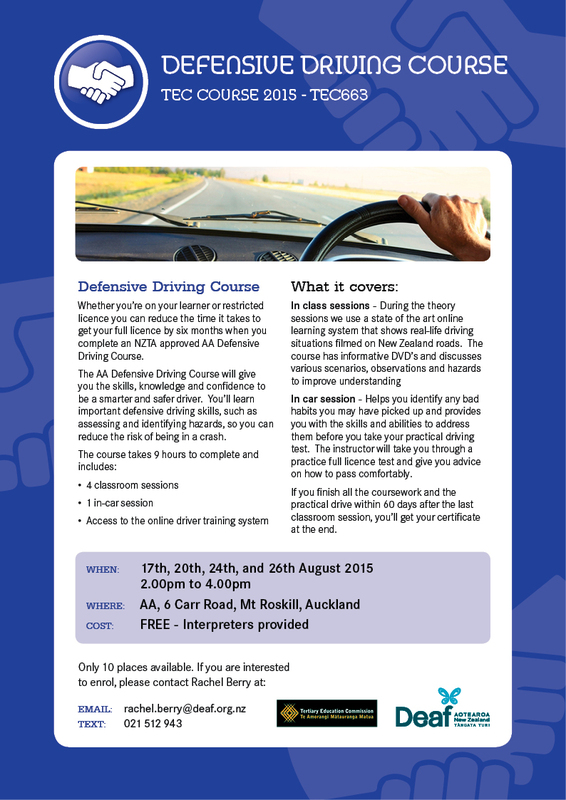 The AA Defensive Driving Course will give you the skills, knowledge and confidence to be a smarter and safer driver. You'll learn important defensive driving skills, such as assessing and identifying hazards, so you can reduce the risk of being in a crash. In class sessions - During the theory sessions we use a state of the art online learning system that shows real-life driving situations filmed on New Zealand roads. The course has informative DVD's and discusses various scenarios, observations and hazards to improve understanding. In car session - Helps you identify any bad habits you may have picked up and provides you with the skills and abilities to address them before you take your practical driving test. The instructor will take you through a practice full licence test and give you advice on how to pass comfortably. If you finish all the coursework and the practical drive within 60 days after the last classroom session, you'll get your certificate at the end. NZSL Interpreters will be present. Natasha will be there to explain the AMI TEC course and Deaf Aotearoa’s New Services, new You TEC course. Time: Door open 11:00am, game starts 11:30am. 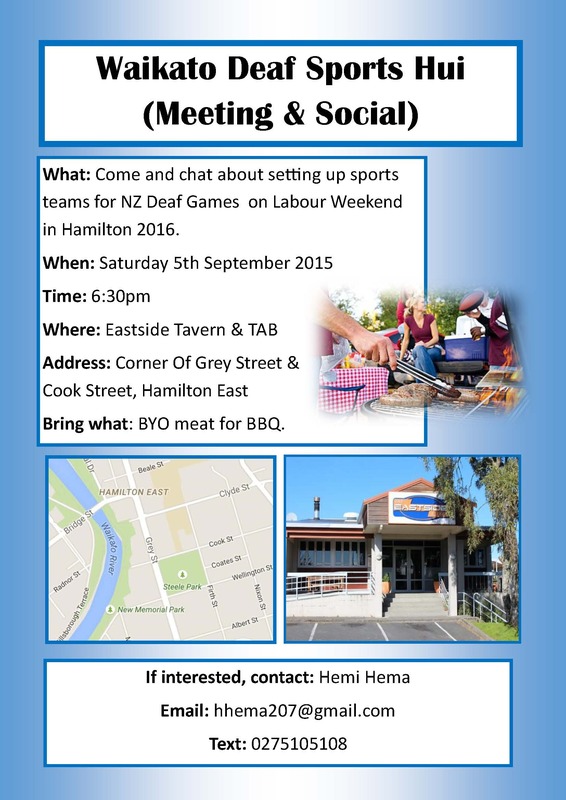 What: Come and chat about setting up sports teams for NZ Deaf Games on Labour Weekend in Hamilton, 2016. 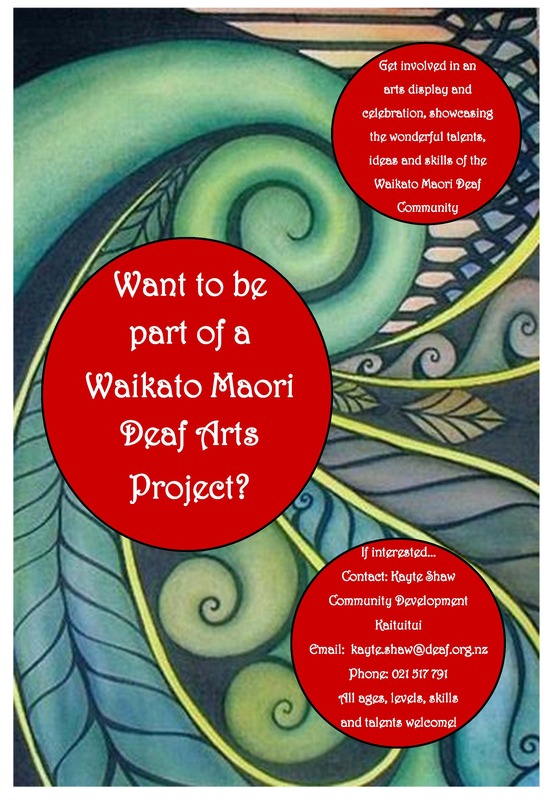 Want to be part of a Waikato Maori Deaf Arts Project? Get involved in an arts display and celebration, showcasing the wonderful talents, ideas and skills of the Waikato Maori Deaf Community. Lots of paints, canvases and paint brushes to use. All ages, levels, skills and talents welcome! A fun family day is planned for dogs, cats (all pets welcome) and human friends. out for some doggie goodie bags for your four-legged friends. Community Education Bay of Plenty (BOP) was formerly known as the Western BOP Adult & Community Education Network [ACE]. 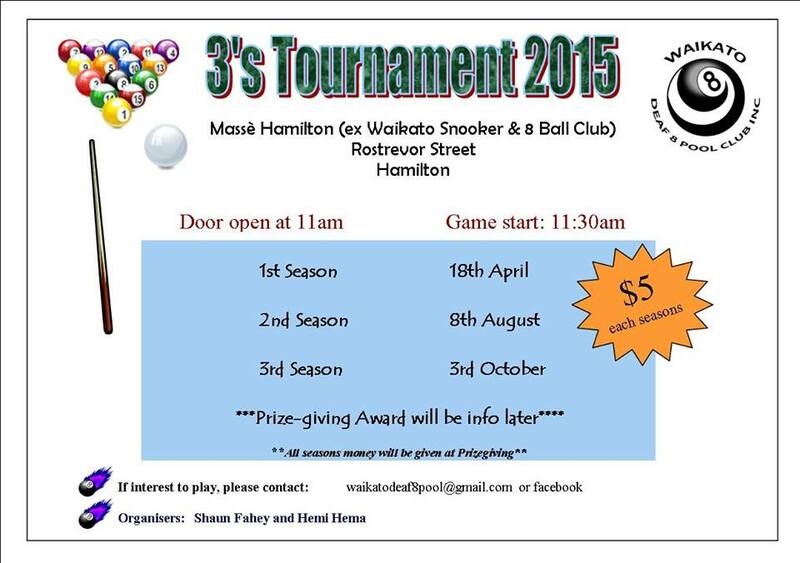 They are a group of local organizations offering community education in the wider Tauranga region. Their primary role is to support organizations and individuals involved in community education, that's you as a tutor or provider. * Professional development days for community education providers and tutors. * A successful Adult Learners' Week every year, which is strongly supported by local councils, education providers, and business organizations. * Marketing opportunities, some free and some at group discount rate. 1. 'Like' the Community Education Bay of Plenty Facebook page for professional development ideas, support, meeting notifications and to keep in touch with what's happening. 2. Market/promote /advertise the classes and courses you offer on the 'Courses and Night Classes in the Bay of Plenty' Facebook page. Send your class brochure to our Social Media Coordinator (bev.hodges@tauranga.govt.nz) to have the details added for you, OR, add them yourself. Zoe Wilkinson - zoew@xtra.co.nz -For more details about Community Education Bay of Plenty and how you can become part of it. 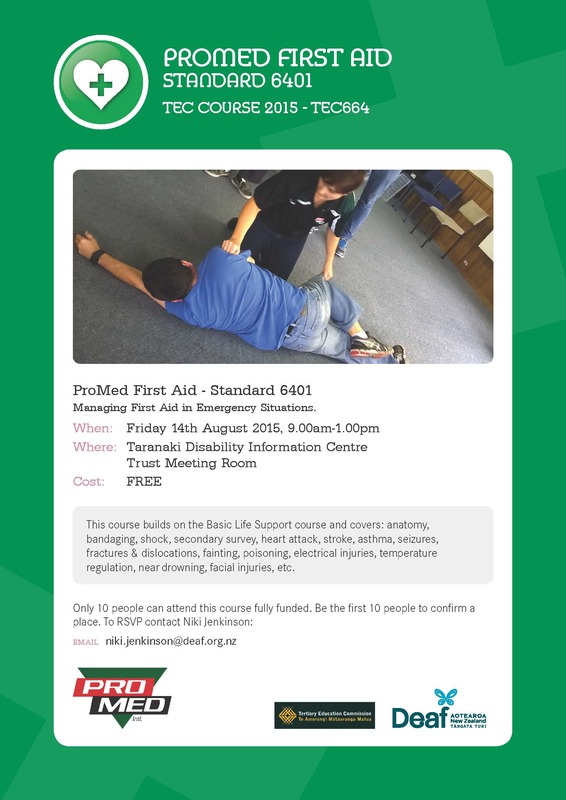 The first 10 people to confirm their place on this course will be able to attend. Do you need to have your signature witnessed, make a declaration, swear an affidavit or affirmation or have originals or copies certified? A Justice of the Peace will be on hand to help every Monday except public holidays at Inglewood Library. Do you need to have your signature witnessed, make a declaration, swear an affidavit or affirmation or have originals or copies certified? A Justice of the Peace will be on hand to help every Wednesday at Bell Block Library. Set in a time when racism is rife in New Zealand, two cultures collide in a tale of love and honour, history and secrets. Rich with myths and fables, music and song, this story is about a Māori-Chinese love affair that will uproot the lives of two families for generations to come. 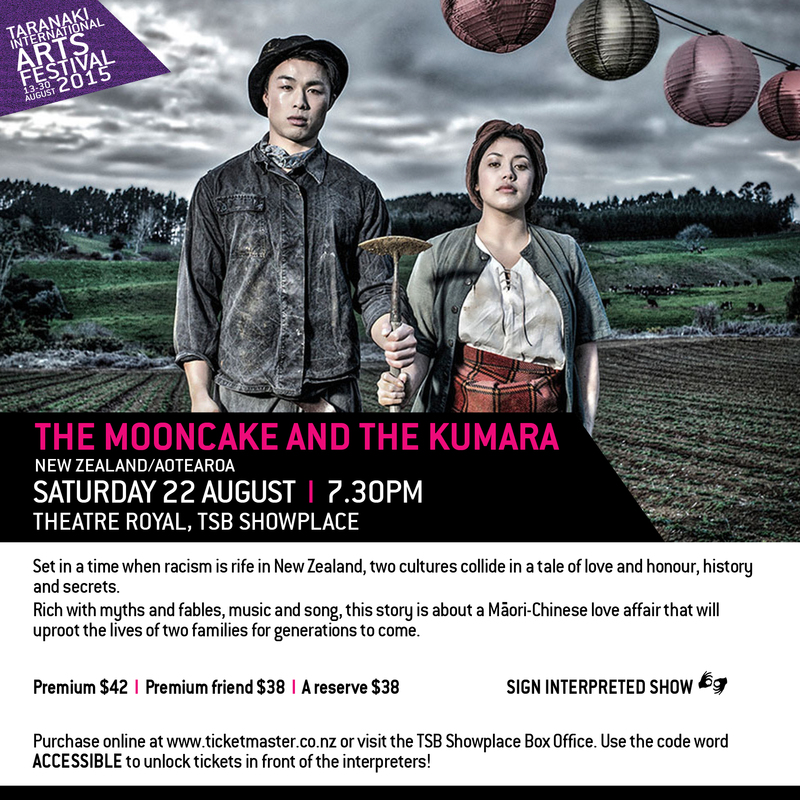 Directed by Taranaki’s own Katie Wolfe, The Mooncake and the Kumara is set 90 years ago in a market garden, where romance blooms among the vegetables. 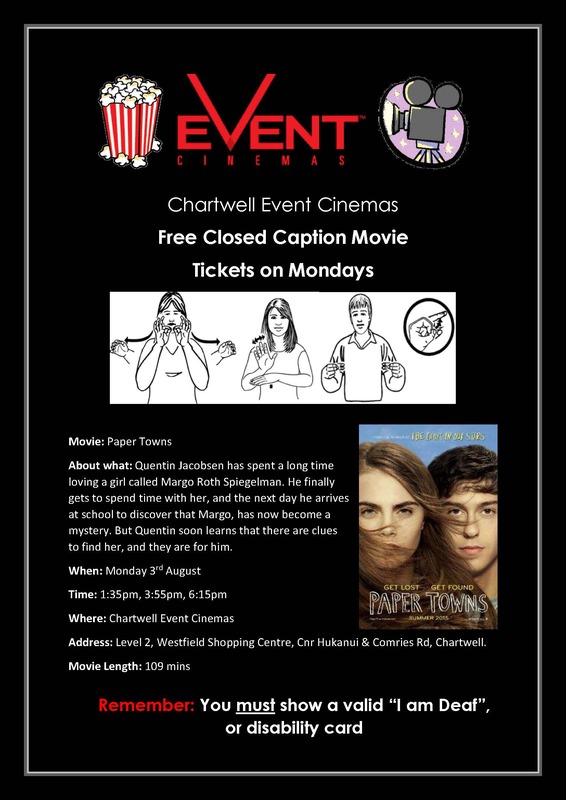 The password is set up for the Deaf community, the password is Accessible. It will be available online on the main page, just type in Accessible next to the yellow lock and then choose the yellow circle seats. You can also purchase from the TSB Showplace box office if the customer quotes or shows the password. Last April we had a workshop on Changes with Child Support and Online IRD account. We had about 17 people came to this workshop. At the end we did not have time to encourage Deaf people to set up their own IRD online account. With your online IRD account, you can easily access to see what you earn ever year (up to the past five years), see how much tax you pay, how much kiwi saver you have plus more. This is a very useful tool for everyone to have and it’s free. If you need to set up your own IRD online account, please contact Deaf Aotearoa and make an appointment and we can assist you in setting up your account. Every Sunday you’ll find a wide range of items and excellent food. Why not set up a Deaf group and go out Sunday morning and look at some fresh food and other awesome things. And you can always finish up your morning with a lovely coffee! 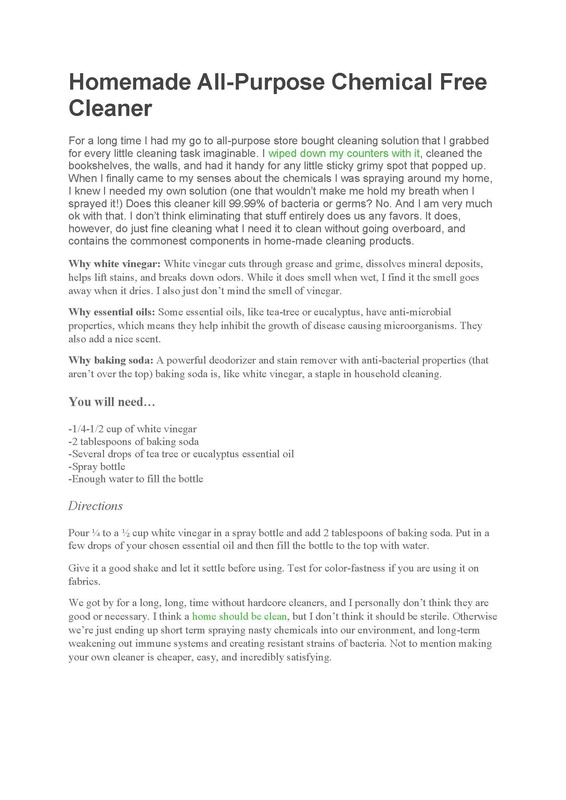 This is perfect idea whether it’s a cheaper option for you or if you just want to have your own home chemical free cleaner! Many people buy cleaning products from shops/supermarkets and worry that there may be too many chemicals in them. Some people say it’s fine but is it really? How do we know? Some people decided choose a safer option and made their own non-chemical cleaner. Here one cleaning product that is chemical free and you can use it to clean in and around your house. See attached flyer for more information, it will explain why each of the items are important to use and what they do and so on. 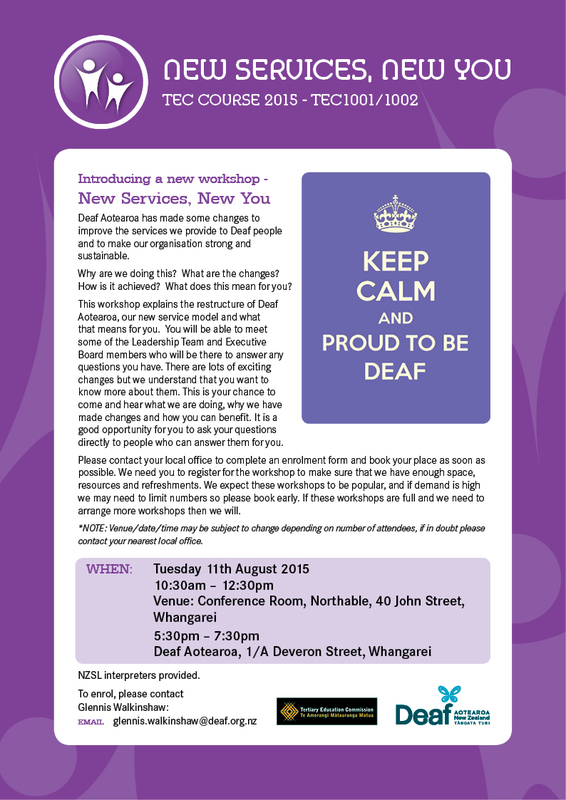 This is a reminder for you if you want to come to one of those workshops to learn about the new changes at Deaf Aotearoa please contact Lianna to complete a registration form. 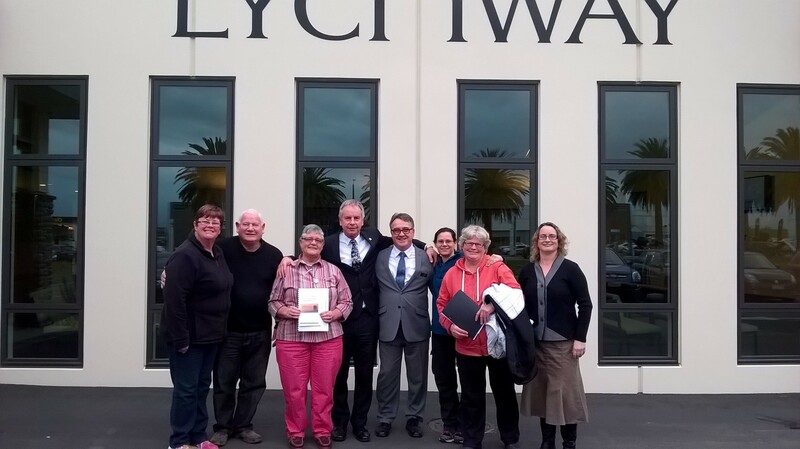 Five participants came along to Lychway Funeral Directors in Palmerston North to learn all about what to do when your loved one dies. This was a fantastic signed guided tour workshop along with a visual presentation, handouts to take away with them and to top it off they had surprisingly provided afternoon tea and nibbles! Both funeral directors made it very warm, welcoming and even cracked a few jokes and connected with our group very well! We were surprised at the stunning exterior, but we were more surprised with the interior which was huge! They cater for small to big funerals in all aspects of preparation! This tour gave us the knowledge that we need to know how it all works, what is done, what is needing to be done, what they do etc! 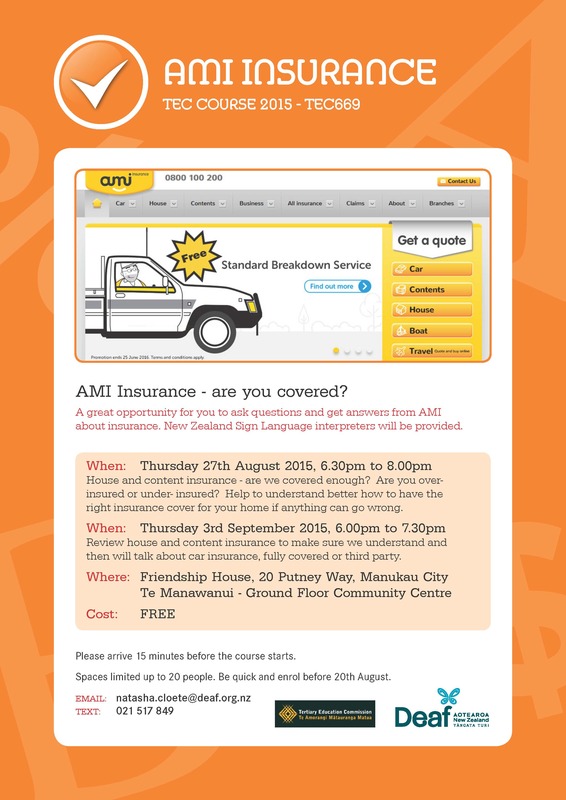 They cover the Manawatu, Horowhenua and Wanganui areas. We will no longer advise in the Manawatu Community Weekly Newsletter if Manawatu Deaf Club is open on Fridays, we will advise you if they’re closed. Reason why is because it’s the same night/time every Friday at 7:30pm, so we will advise otherwise. 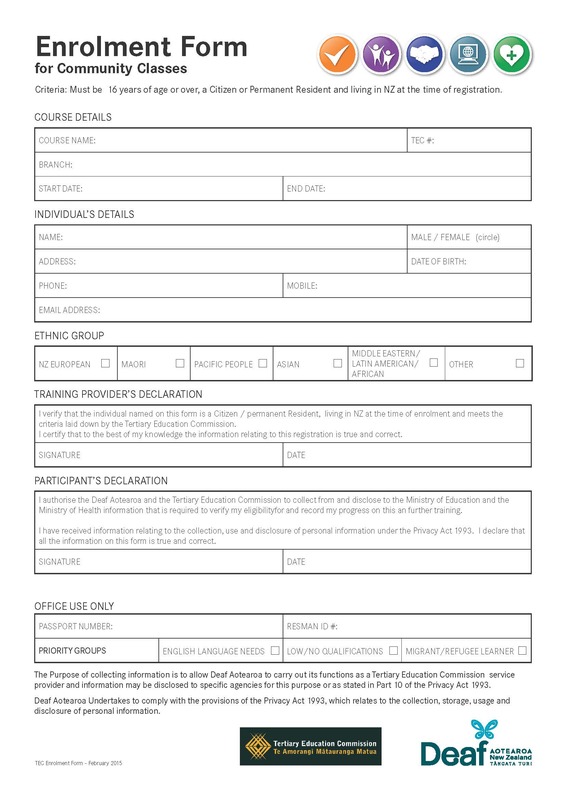 Please contact your local office to complete an enrolment form and book your place as soon as possible. We need you to register for the workshop to make sure that we have enough space, resources and refreshments. We expect these workshops to be popular, and if demand is high we may need to limit numbers so please book early. If these workshops are full and we need to arrange more workshops then we will. On the 1st September 2015 Pam Witko's mother Doreen will be celebrating her 100th birthday and she wanted to share a little bit about her amazing 100 years. Doreen was born in Westport and was the eldest child in her family. After Doreen, there was Reg, her hearing brother who is now 96 years old, and then two Deaf brothers, Mervyn and Ray. Her family moved to Napier when she was 11. Doreen attended Sumner School for the Deaf for ten years, from 1921-1930 and experienced the Napier earthquake on 3rd February , 1931. After working several years and being laid off, she set up her own dressmaking business working from home under the name of ‘Doreen Forman Dressmaker’. She met her future husband Max Howell (Deaf) at the Wellington Deaf Club and they married in June 1948. One month later they attended a function to celebrate Helen Keller’s visit to Wellington. They had two Deaf children, Pam Witko and Garry Howell. Doreen and Max played Indoor Bowls for the Deaf for many years. She is currently a Life Member of the Wellington Deaf Society. Currently, Doreen has 9 grandchildren and 23 Great-grandchildren. She spent 60 years of her life living in Paraparaumu and is currently in a rest home in Johnsonville. After 100 years, she still likes spending time with family and friends and enjoys a lot of laughter! 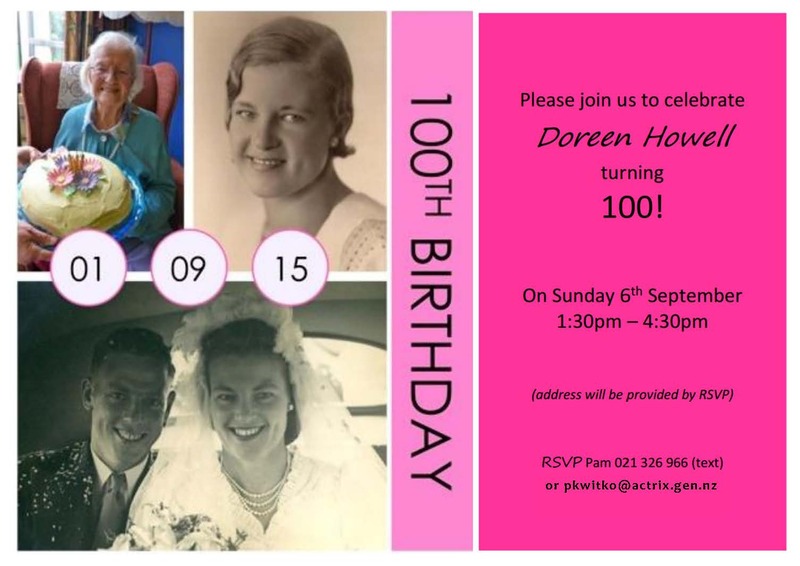 Doreen is having a birthday party on the 6th September, people are welcome to join her centenary celebration. If you wish to join, please email Pam at pkwitko@actrix.gen.nz or text 021 326 966. 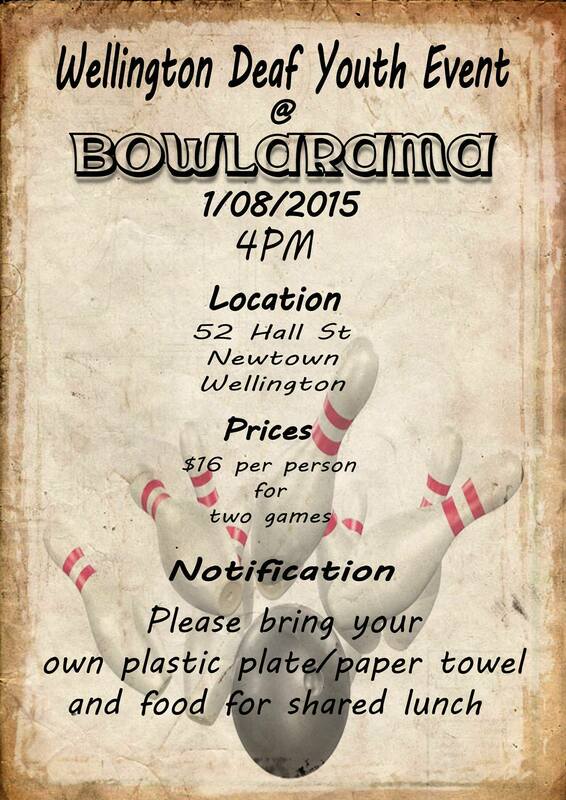 WDYG is having a Bowlrama event tomorrow, 1st August at 4pm. At Newtown’s Bowlrama, 52 Hall Street, Newtown. 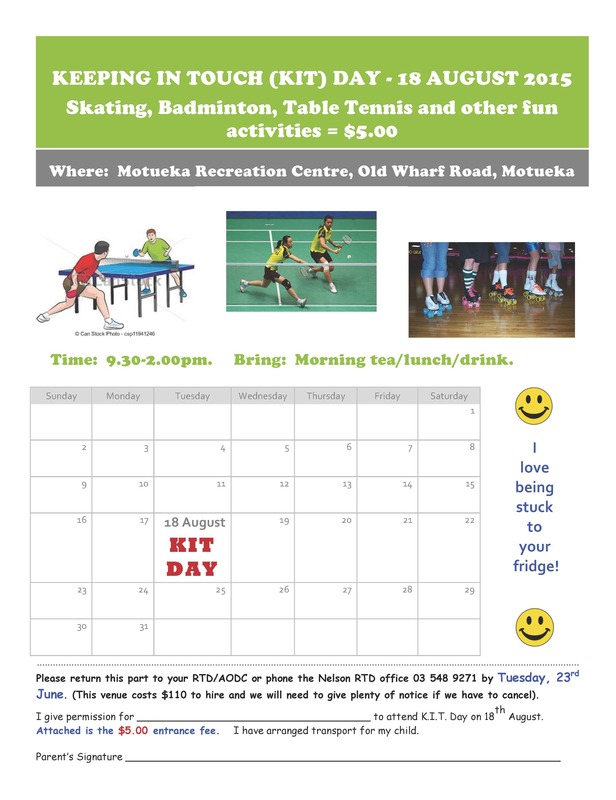 $16 for two games, please bring own plate and food for shared lunch. Petone Foreshore will come alive on Saturday 1st August, 2015 for the 9th annual Petone Winter Carnival. With carnival rides and bouncy castles, fire sculptures, food vendors, stages programmed with local bands and other entertainers, market stalls and interactive activities, there is something for everyone. The Carnival opens at midday with the Mitre 10 MEGA Polar Plunge - a mid-winter swim for those crazy enough to brave the cold harbour waters. All the rides and activities will be going from 12pm until 7:30pm. When the sun sets, the braziers are lit for marshmallow toasting (from 5:30pm) on the beach. The night culminates with fire sculptures starting at 6:40pm and the breath-taking Fireshow from Petone Wharf at 7:30pm, which is seen from the event as well as across the Wellington Harbour. If you regularly travel in or out of Wellington City, or are planning to soon, be aware there are some full closures of the motorway coming up – the first and most extensive will be this Saturday 1st August. Partial closures are also planned overnight on Sunday and Monday nights, 2nd and 3rd August. Over the next few months, the New Zealand Transport Agency is planning a number of partial and full closures of State Highway 1 between Ngauranga and the Terrace Tunnel. The closures will mostly be at night between 10pm and 6am. The exception is the one coming up on Saturday 1st August. State Highway 1 will be closed in both directions from 10pm between Thorndon and Ngauranga. The southbound closure will be reopened by 6am on Sunday 2nd August. However, the northbound direction will remain closed until approximately 10:00am. You’ll still be able to get into and out of Wellington at all times, but you’ll need to factor in extra time to get where you are going and follow the detours. Watch for details on the electronic message boards on the highway and the extra mobile signs that will be in key spots around town. The SH2 off-ramp at Ngauranga will be closed from 10pm Sunday to 6am Monday. All southbound lanes on the Ngauranga flyover at the bottom of Ngauranga Gorge will be closed from 10pm on Monday night till 6am on Tuesday. Traffic will be diverted onto the Hutt Road instead. Further closures are planned in September and maybe October but the dates are yet to be confirmed. The Nelson Office will be closed from Wednesday 5th August, re-opens on Monday 10th August. Learn more NZSL Conversation skills and develop your grammar skills. This course is designed for those who have completed 1A. Open for adults and College students. Learn more NZSL Conversation skills and develop your grammar skills. This course is designed for those who have completed level 1A and 1B. This workshop will be provided you to understand the restructure of Deaf Aotearoa, our new service model and what that means for you. You will be able to meet some of the Leadership Team and Executive Board members who will be there to answer any questions you have. There are lots of exciting changes but we understand that you want to know more about them. 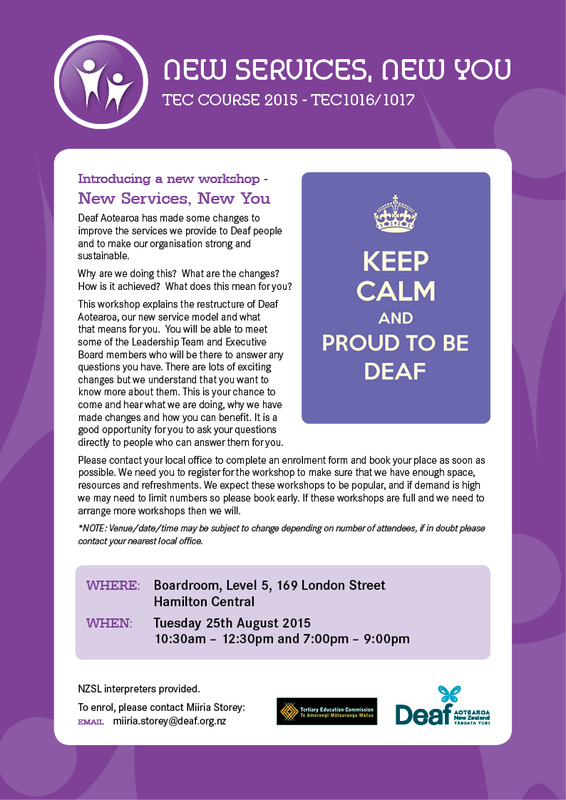 This is your chance to come and hear what we doing, why have made changes and how you can benefit. It is a good opportunity for you to ask your questions directly to people who can answer them for you. We need you to register for the workshop to make sure that we have enough space, resources and refreshments. We expect the workshops to be popular, and if demands is high we may need to limit number so please book early. If the workshops are full and we need to arrange more workshops then we will. Would you like your children to attend a free Mitre 10 DIY workshop on making their own hand titles? 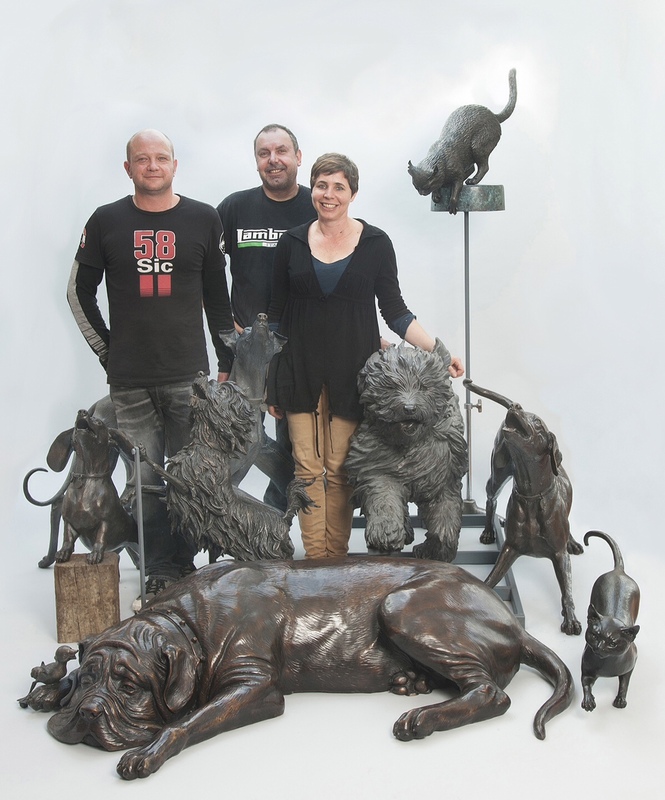 A tutor, Flip Leijten will be facilitating the workshops. There will be two groups with a maximum of 20 kids in each group. Please bring old clothes and a parent/caregiver to help with your child/ren's project. 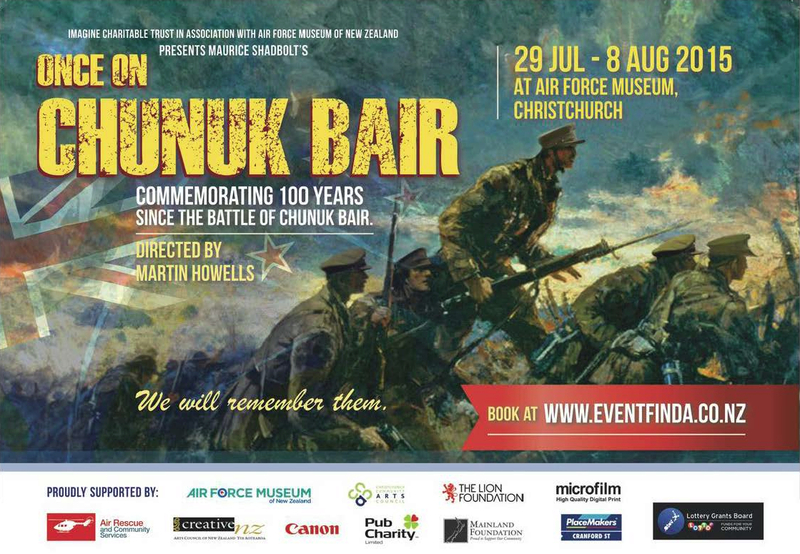 A well-known New Zealand writer Maurice Shadbolt wrote a drama ‘Once On Chunuk Bair’ – it is about the camaraderie, courage and heroism of NZ soldiers early in World War One on the Gallipoli Peninsula. On the high ground of Chunuk Bair, the soldiers of the Wellington regiment deal with malnutrition, water deprivation and injury. They fight bravely, with no support, but with defiant black humour and enormous strength and fortitude. Shadbolt interprets this episode of the war as a defining moment in the birth of New Zealand as a nation. The play will inspire pride in New Zealand’s heritage and a challenge to live with courage and passion. It has significance for people of all ages. 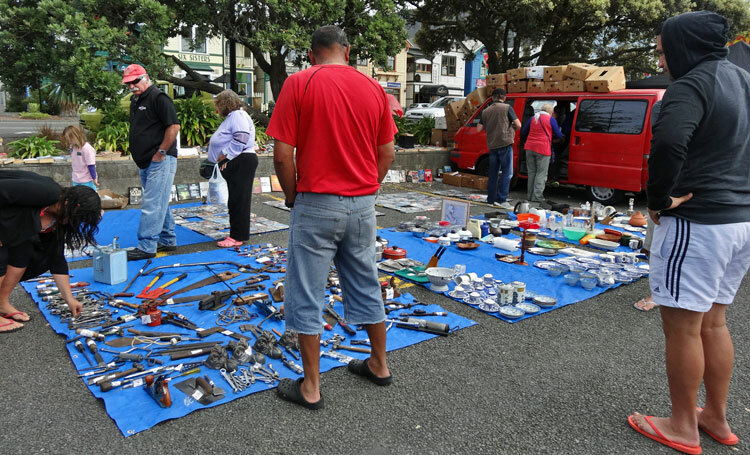 Do you remember the weekly markets in the Cathedral Square over the summer 2014 – 2015? Our Christchurch Food Trucks have found a new home at The Commons every first Friday of the month. This was started by Christchurch City Council in Cathedral Square across summer as a pilot project, it was meant to end at Easter 2015 and it was popular so it was keep going. Gap Filler is hosting a winter season event at The Commons and Christchurch City Council. We would love to see your feedback by the end of September to see if they could do it again next summer. Why not come down to The Common and enjoy the Christchurch Food Trucks! Entertainment, games and of course…..FOOD! Reminder that Brydee is not available until June, 2016. Hayley Best is available only evenings and Saturdays. If you want to book a communicator please contact Michelle with date and time. The Deaf Aotearoa community computer is available to use. You can use Skype, Video Relay Service, email and more. Please contact Anna if you have any questions. As of the 30th August DRC will be Located at their new Gala Street Premises – Beside Colonial Bakery. 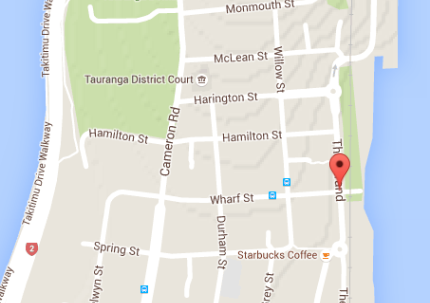 Deaf Aotearoa Office will still be in the same place for the time being. It is essential that if you want to see Rebecca you make arrangements via email and text to book your appointments as there will be no one to greet you at the front door. You will be locked out for security reasons. Rebecca is available – Monday, Tuesday, Wednesday, Thursday 8:30am – 4:30pm.